Rhinoplasty is one of the most popular cosmetic surgeries among youngsters. Rhinoplasty, also known as nose job refers to a surgery on the nose to change its shape according to one’s beauty needs. Not only for just beauty purpose, it can also be done to improve the nose function such as to correct the breathing problems related to nose or some birth defects. Get the best Rhinoplasty treatment in Delhi/Gurgaon by considering Cosmotree Clinic. Rhinoplasty majorly involves the correction of shape of the nostrils, length & width of the nose and Nasal asymmetry. Before deciding on the surgery, it is important to discuss the risks and benefits of the surgery. If you are deciding on a nose job, then firstly set an appointment with your surgeon, talk about your expectation from this surgery and how you would like to change it. A surgeon can tell you how rhinoplasty would enhance your appearance. Keep one thing in mind that there is no such thing like a perfect nose. Though, surgery can enhance your facial structure and natural beauty. If you are a chain smoker and has many health issues, so you will be not eligible for Rhinoplasty until you stop smoking or recover your health issues. Side effect of Rhinoplasty varies from person to person which includes infection, septum perforation, blood clots, excess bleeding, slight scarring and difficulty breathing. In some cases, when surgery does not go as planned, there might be a need of revised rhinoplasty. 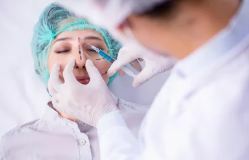 Going for routine checkup, gathering all information about nose job, maintaining proper hygiene can help prevent the side effects of nose job. After having rhinoplasty, a patient must need to follow all post-treatment guidelines given by the Dermatologist. The patient is advised to brush their teeth gently to avoid the jostling their nose or upper lip. To avoid the swelling and reduce pain you can use ice cubes. If you face major issues, Contact your surgeon immediately. If your nose job done properly, it can lasts forever. Or if the desired results are not reached, then a second nose job will be conducted. Swelling and scars will disappear with time. Before having Rhinoplasty, choose your clinic wisely as poor surgical treatment can lead to permanent deformity. Nowadays, Rhinoplasty is more effective and accurate than at other time in history. With the right combination of experienced and surgical skills can produce a naturally beautiful nose that will flatter the face beautifully. This entry was posted in Rhinoplasty and tagged Nose Job, Rhinoplasty, Rhinoplasty in Delhi, Skin Treatment in Delhi. Bookmark the permalink.